Sometime ago, I was approached by a businessman. He owned a successful securities trading company. Trading in all sorts of securities like stocks, bonds, commodities, metals. He had recently acquired some commercial office space for a major expansion. My task was to design a floor plan according to their requirements. I visited the place for inspection. It was a large hall, with dimensions 45′ x 90′. I had to deal with a few existing columns, but it was decent. I was given a few requirements, but it was still flexible. More requirements were to be added later. The building was already constructed, so external window locations were already fixed. So, I began working on the drawing, and after many hours of hard work, and many revisions, I got my first drawing ready which had to be presented to the client for further deliberation. It was a good drawing. It was a result of many hours of hard work. The flow was good. But client wanted more options. He felt it was too complicated. It did not “feel” good enough. So, I was back to the drawing board. I was also asked to move the server room accessible from the Conference room. I tried to simplify the drawing, improve the free flow in the drawing, and presented my new drawing. It was good. I was happy with the design. Large cabins, good natural light in the lobby, central access to the trading workstations. But the client was not satisfied. Still too complicated. 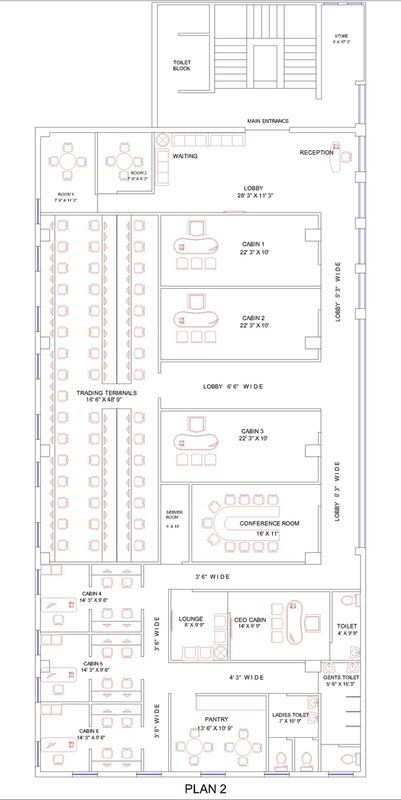 Upto 80 people could work in that office at a time… Navigating through it was complicated. Plan rejected. So, I had to start working again and come up with something different. It was an evolution of design, slowly being perfected in every iteration. I completed and presented my third drawing a few days later. Here, my objective was quicker, easier access to Trading Workstations. So, I decided it would be better to include two access points to the Trading area. Easier to navigate. More open. But the client was not satisfied. For one, I was wasting too much space for navigation purposes. And also, CEO Rest room was gone. It was a primary requirement. This drawing would not work either. I had to combine all the three earlier drafts together, and simplify them… Easier Navigation was important. No puzzles. No wasted action. Here was my fourth drawing. This plan was finalized. The client was happy. Good, clean navigation. All requirements fulfilled. Good Design is a journey, not just a destination. You have to go through different iterations, slowly improving and optimizing, until you reach a point where the design becomes good. You can always continue to improve upon it, but it would give diminishing returns after a point. This entry was posted by Benzu JK on November 17, 2012, 1:05 pm and is filed under Architectural Drawing. You can follow any responses to this entry through RSS 2.0. Omg!! This is an amazing evolution of a perfect design as per clients requirement. This is quite interesting to me. An inspiration as well. Thanks. .
Good design a journey but sometimes it is hard to know where to start.